Our world’s honey bee population continues to decline. 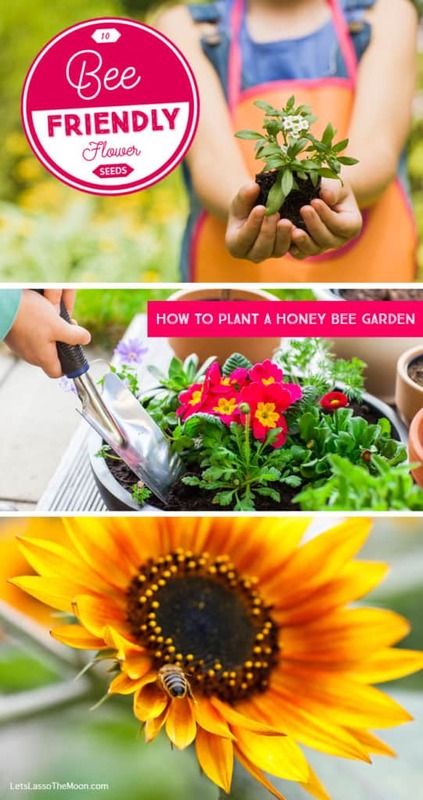 This summer, use your garden space to not only connect with your kids, but to help grow a beautiful (and pesticide-free) environment for your local bees. 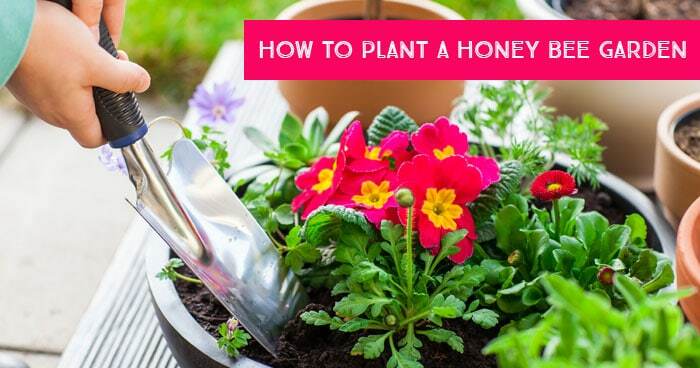 Get tips on how to plant a honey bee garden with kids below! Sometimes these numbers are so large they feel unreal to me. 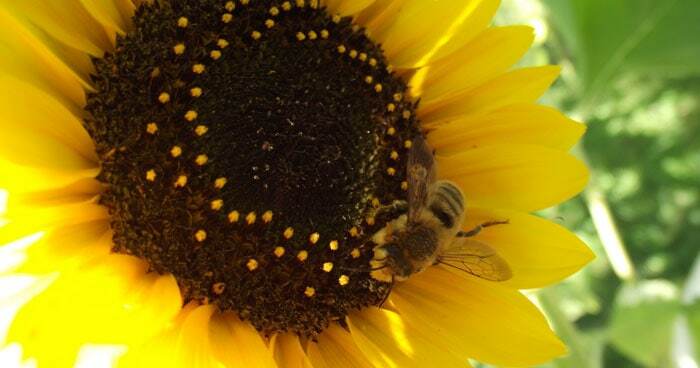 Earlier this spring, my daughter wrote an essay Get the Buzz on Honey Bees. It was fascinating. I highly recommend you do a little research with your child and find out what this means for YOUR state. Door County cherries would decline by 60 percent; producers would have lost $1.13 million. Wisconsin apple growers would lose as much as 80 percent of their crop without honeybees; that would have meant a $10.7 million loss to those growers. Without placing hives in the local cranberry marshes, our growers would lose three-quarters of their cranberry crop – a $173 million loss. For additional information about Wisconsin specifically, check out this short Honey B ee Fact Sheet (PDF) from UW Stevens Point and the Center For Land Use. Also, be sure to head to the library to pick-up a couple of children’s books. There are many great titles on this subject. You have the chance to plant a seed of something very special in the hearts, minds, and spirits of your children as you garden together. Whether you call it natural or essential or peaceful or spiritual, it is a strong and compelling motivation to focus your play and learning outdoors. 1. Pick your spot. Start a container garden on the deck or a raised garden in your yard if a traditional garden is not in the cards. Don’t let space be an issue. Their favorites seem to be native flowers with single blooms in open, daisy-like or long tubular shapes. 3. Purchase seeds. While you can buy plants from the nursery, I highly recommend starting with seeds. Your children will have a true sense of ownership and see the full cycle of life. An important word of warning: Many retailers (Home Depot, Lowes, and Walmart) are selling plants treated with neonicotinoid pesticides, which are suspected to be responsible for US bee declines. In a recent press release, Lowe’s said it will phase out neonics in shelf products and plants by the spring of 2019, as suitable alternatives become available [source]. 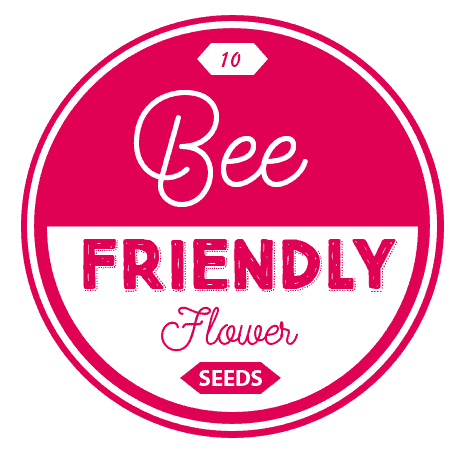 Starting from seeds ensures your garden is helping, not harming bees. You could use plastic, cardboard, or fiber plant pots bought from a nursery; tin cans; toilet-roll tubes; egg cartons or even eggshells; newspaper rolled into tubes; or you could even plant the seeds in the ground. 5. Plant and grow. When you’re seedlings are ready, transplant them into a pot or container garden and watch your flowers grow. 6. Keep on learning. 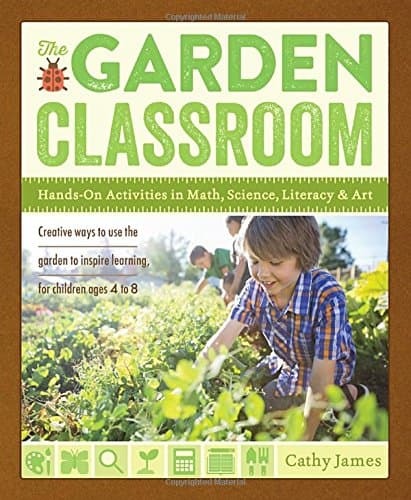 What I love about The Garden Classroom is how you can make education playful. It is full of tiny gardening experiences that you could still do: miniature gardens, grow your own meadow, make a dinosaur world and more. This entire book is filled with SIMPLE and inexpensive activities to keep the kids learning over the summer. It fosters imagination and creativity in wonderful and artistic ways. 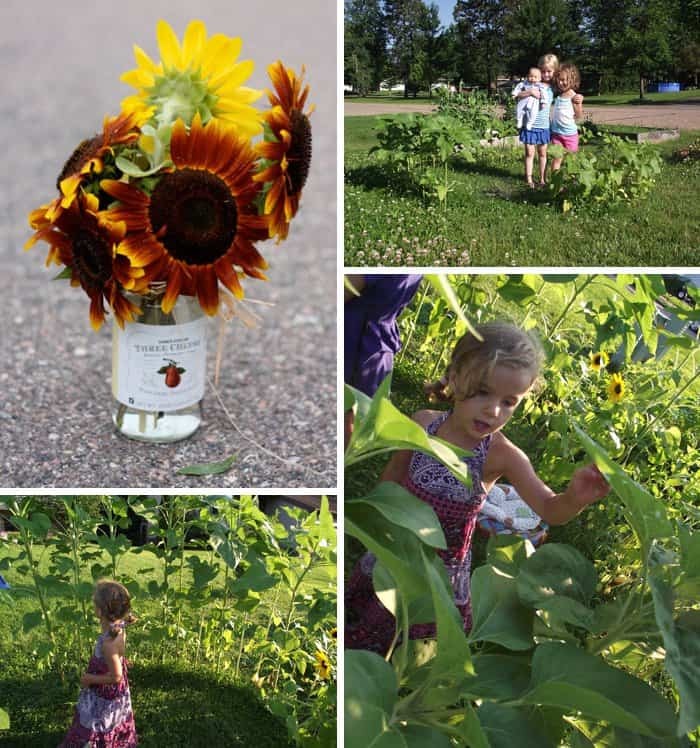 Sunflowers are an excellent choice if you want your children to experience a full cycle of starting something from seed, seeing it grow almost in front of their eyes, and harvesting their own sustainable seed for planting the following year. I couldn’t agree more. We love watching the plants grow to soaring heights, there is a constant buzz buzz buzz all summer long, and we enjoy watching the birds come pull seeds from the heads in the fall. Sunflowers in old spaghetti sauce jars also make excellent impromptu gifts for new teachers the first week of school! I hope you have fun planting with your kiddos. 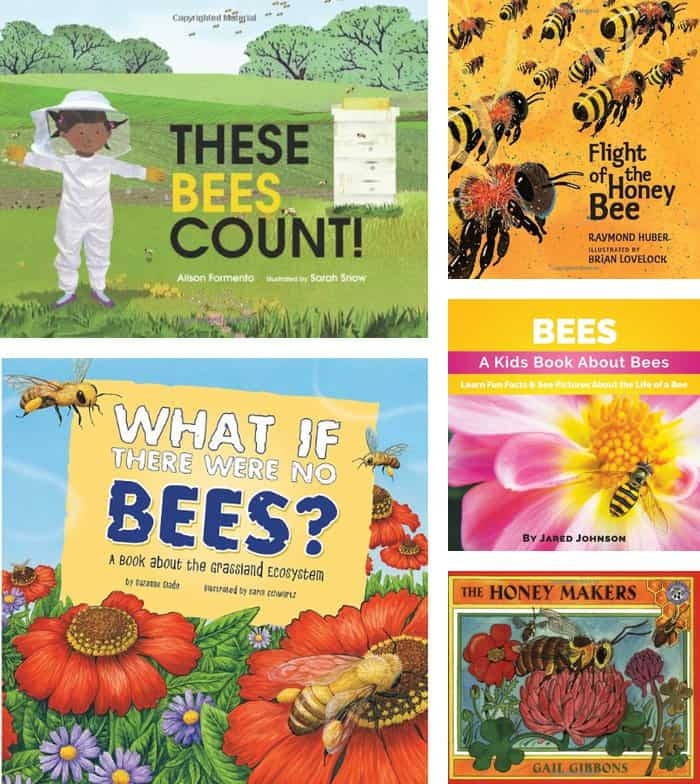 If you have any questions about the bee garden, the sunflower fort or the book, please don’t hesitate to ask. Also, I’d love to see photos of your garden. Tag me on Instagram (@letslassothemoon) or share them on our Facebook page here. Common Sense Disclaimer: We’ve grown sunflower forts for the past four years without any issues with bee stings. However, this is always a possibility. I have one more book to add to your list. The Beeman by Laurie Krebs published by Barefoot Books. This books has some great educational end notes on bees and a recipe for honey apple muffins to bake with the kids.